I’ve been meaning to bake some of those stained glass cookies for ages. Originally, I wanted to make them in a winter-themed version for Christmas. 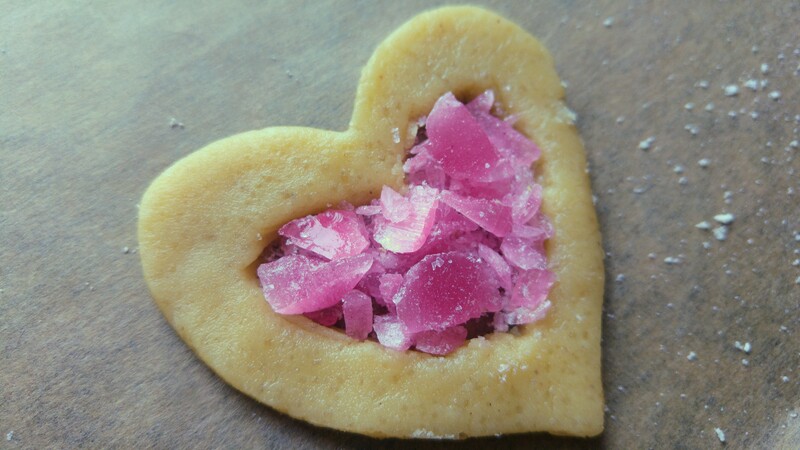 Having baked hundreds of other festive cookies I had to decide against that idea though and moved it to Valentine’s Day. 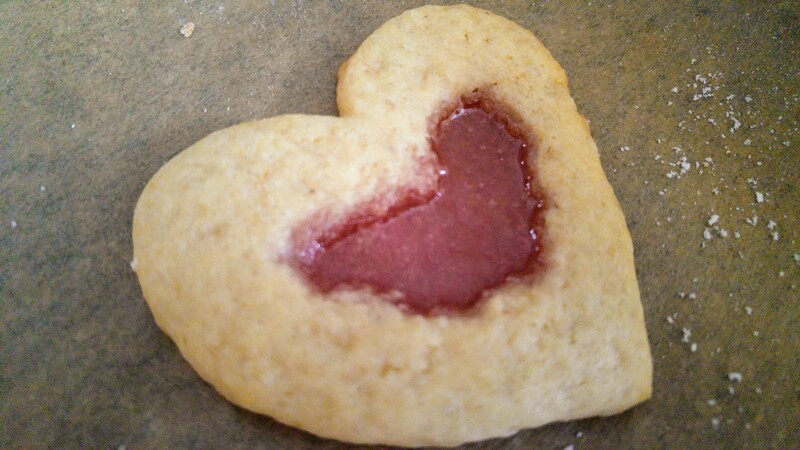 cookie cutters – ideally, two of the same (heart) shape but different sizes (to cut the windows in cookies). 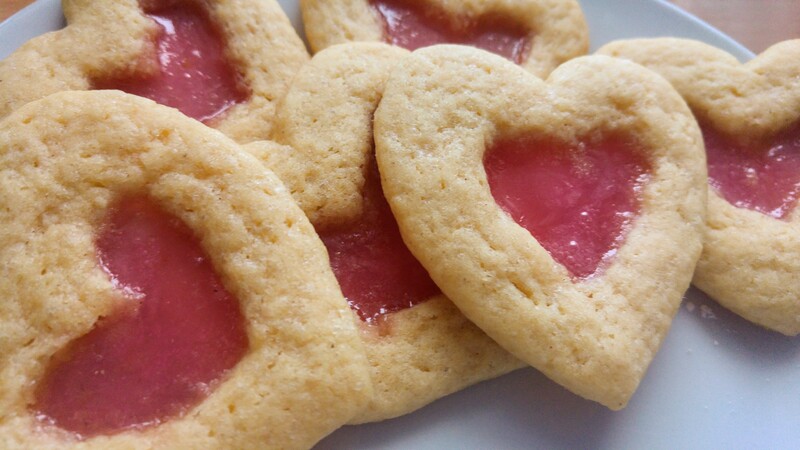 If you only have one cookie cutter, you’ll have to cut the windows using a spoon or a knife. Beat the butter with coconut oil with an electric mixer. Add the rest of ingredients, mix until well combined. Refrigerate for 30 minutes. Smash the sweets. Warning: it’s a messy process. 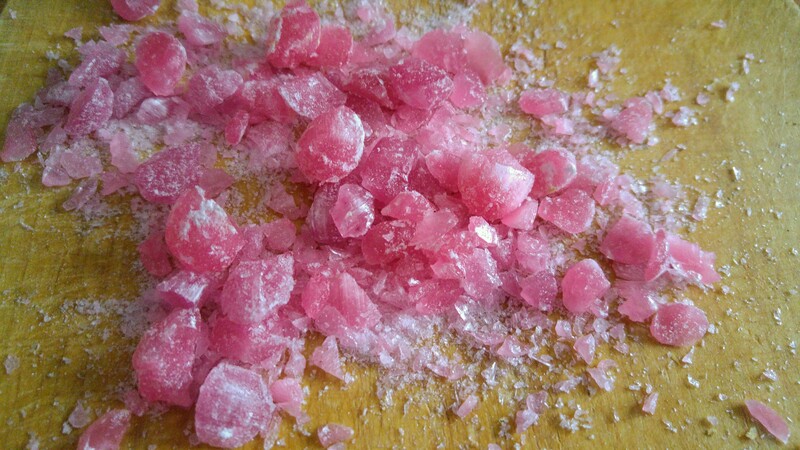 I put my sweets in two layers of plastic bags, covered them with a tea towel and then battered with a hammer – some pieces still managed to get out and spread around the kitchen. Overall, the smaller the pieces, the better. Due to the mess the sweets had made in my kitchen despite the precautions, I left a lot of larger bits – luckily, they melted without any problems. Roll out the dough, cut out your cookies with holes inside (using a smaller cookie cutter in the middle or manually scooping some of the dough out). Move the cookies to a lined baking tray. Fill each hole with crushed sweets. Bake the cookies until the sweets are melted – in my case it took about 7 minutes. The time may vary depending on your oven – observe the sweets and once you see them start to boil (bubbles appearing on melted sweets) – immediately take them out of the oven. If you leave the cookies in the oven for too long, sugar in the melted sweets will caramellize and turn dark brown. Oh really? I thought it was a new trend, I think I’ve only seen such cookies all over the Internet in the last few years. 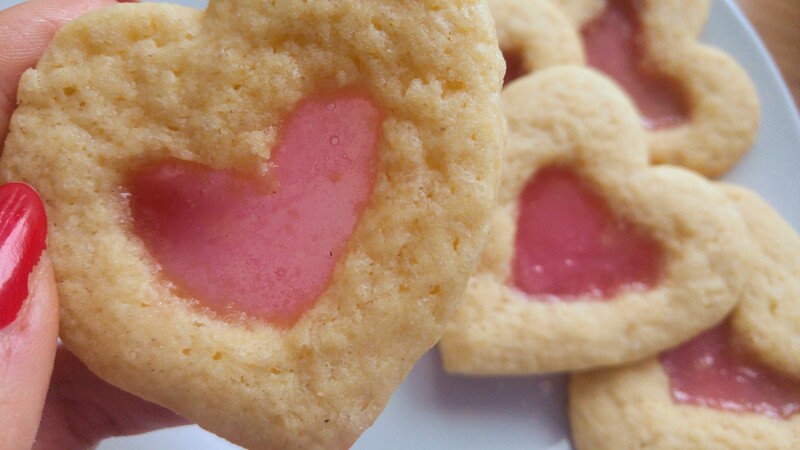 Such pretty cookies for Valentine’s day! Looks delicious. I love cookies, thanks for sharing this wonderful receipt with us! These are almost too pretty to eat! Love these. More like, the cookie wants to convey “You will be single forever”. Quite appetizing. Keep up the skills! Hahaha 😀 I guess that’s a good metaphor indeed. 🙂 Better do as the recipe says in that case! Alphe!! These are just adorable. You are so talented & creative! !